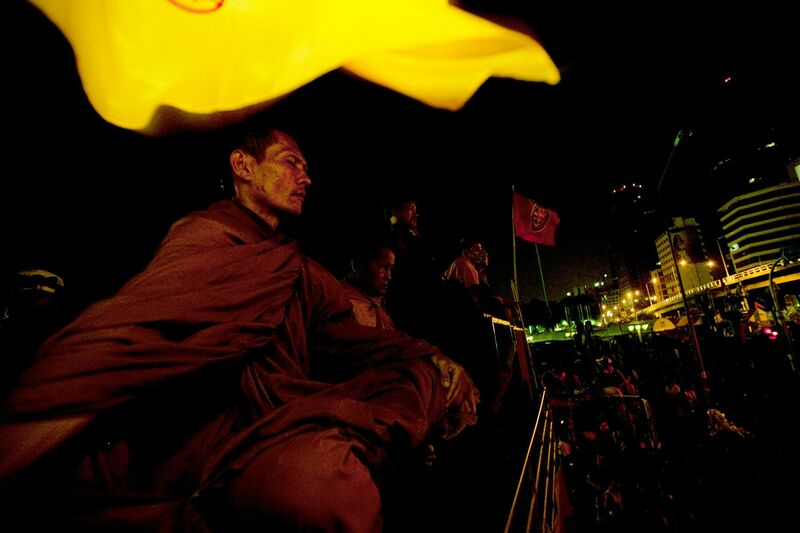 A monk supporter of The United Front for Democracy AgainstDictatorship (UDD). 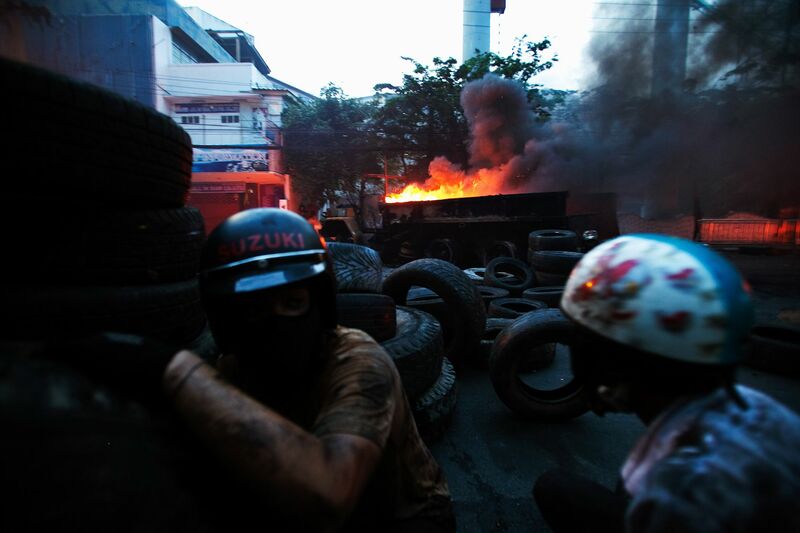 Members of The United Front for Democracy Against Dictatorship(UDD) burn tires during clash with soldiers. 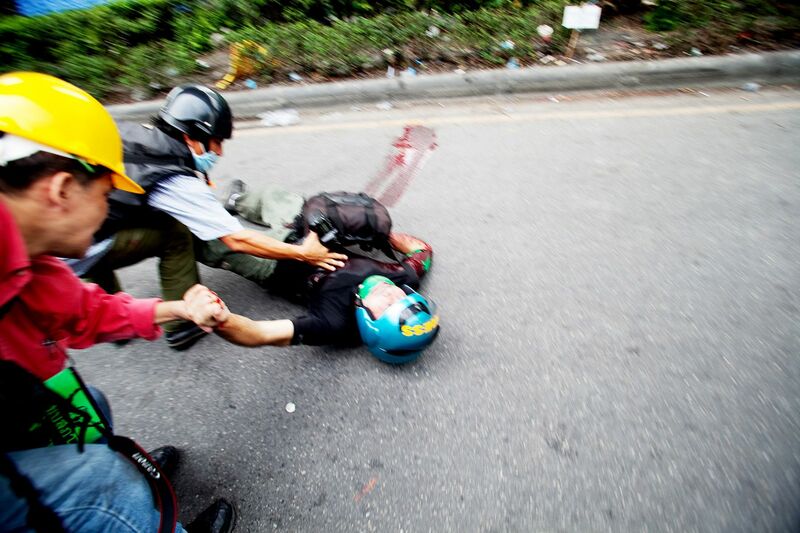 A volunteer fire fighter was shot in his head while helping an injuredUnited Front for Democracy Against Dictatorship (UDD) demonstrator. 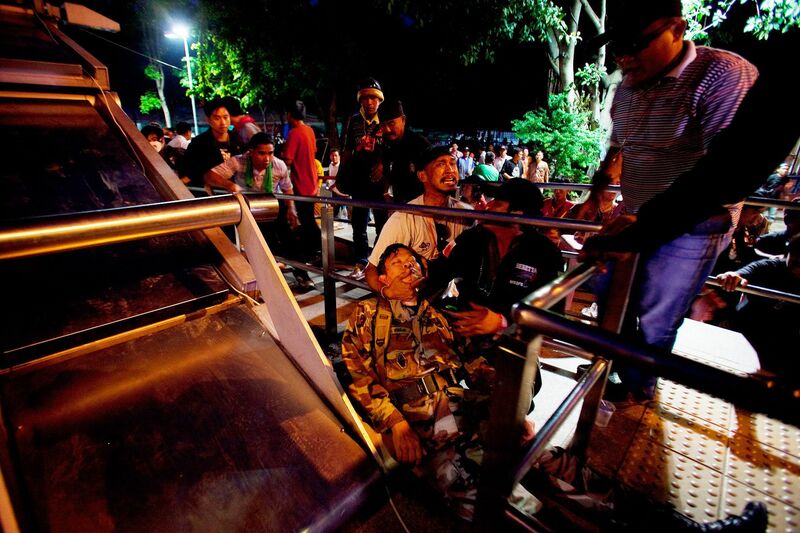 Monks who are members of The United Front for Democracy AgainstDictatorship (UDD) sit and wait for soldiers expected to try to remove their protest camp early that morning. 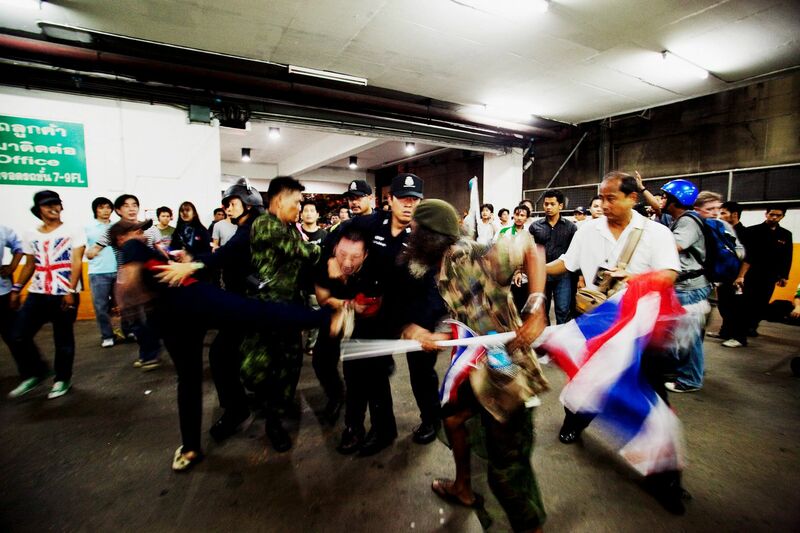 United Front for Democracy Against Dictatorship (UDD)members arrested a suspected spy then beat up inside a car parking. 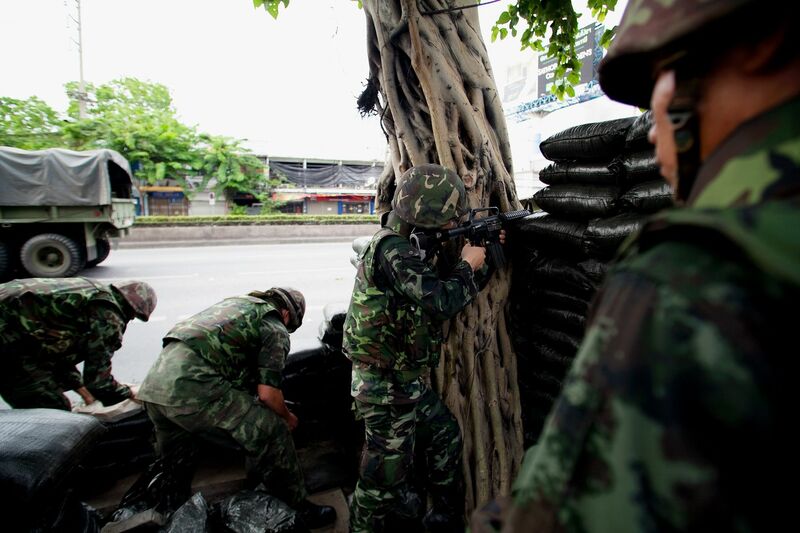 Soldiers build fortifications from sandbags near The United Front for Democracy Against Dictatorship (UDD) demonstration site. 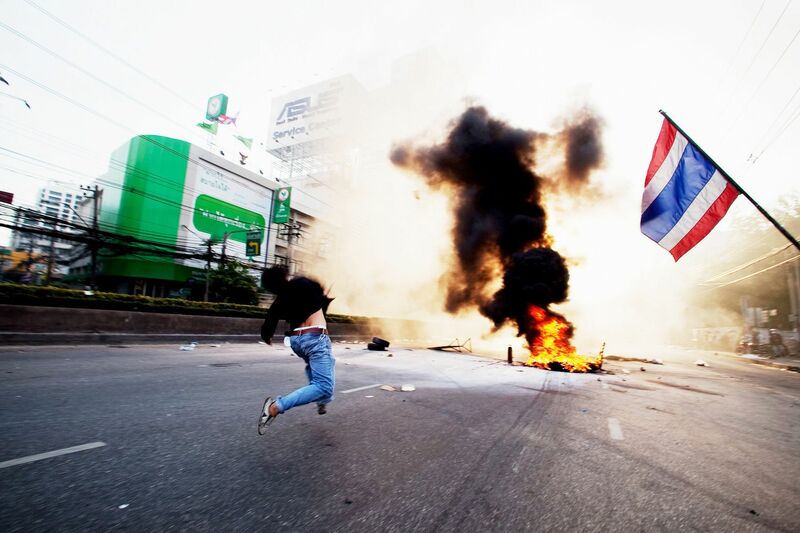 A member of The United Front for Democracy Against Dictatorship(UDD) throws a Molotov cocktail at soldiers. 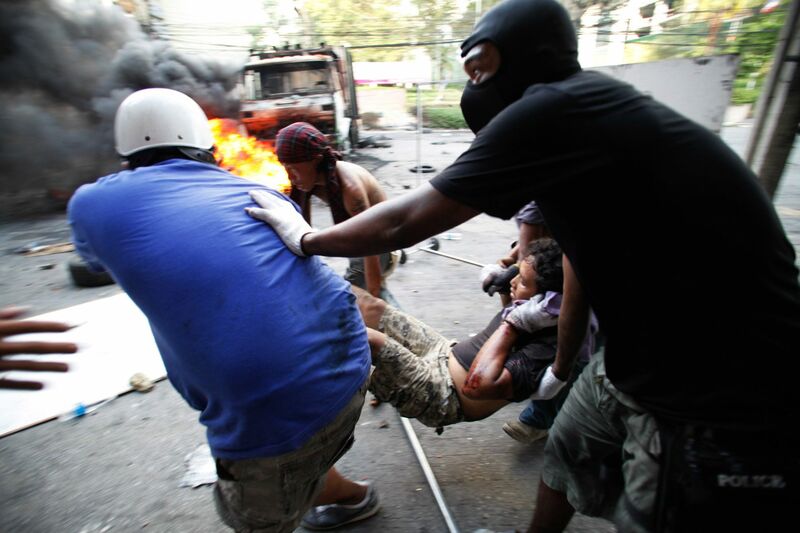 Members of the United Front for Democracy Against Dictatorship(UDD) carry an injured demonstrator to safety during a clash withsoldiers. 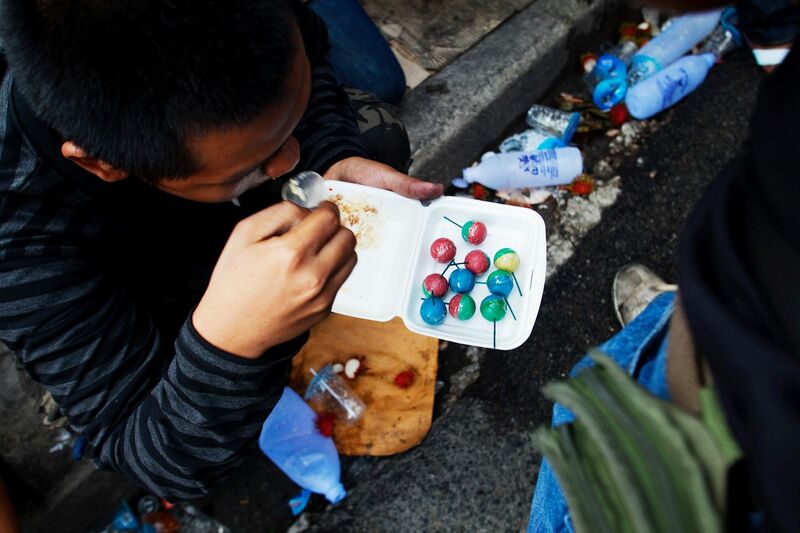 During a clash with soldiers, a member of The United Front forDemocracy Against Dictatorship (UDD) eats lunch off a container that also holds ping pong bombs. 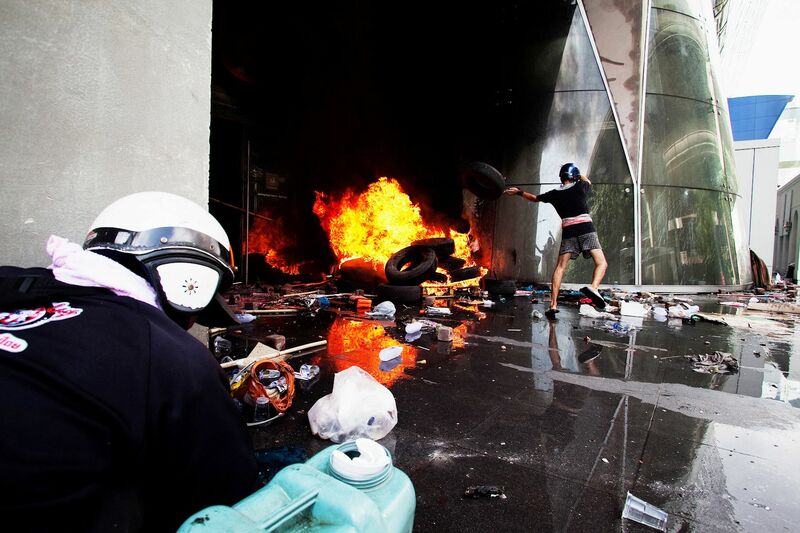 Members of the United Front for Democracy Against Dictatorship(UDD) during a clash with soldiers. 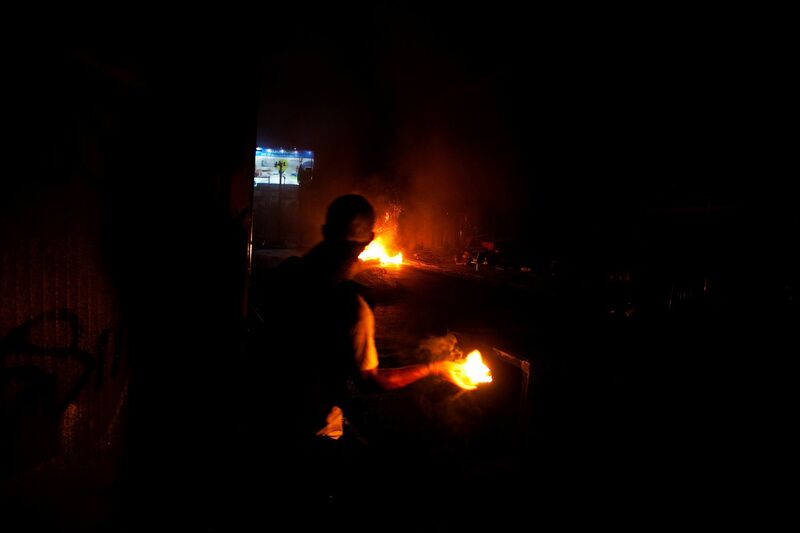 A young boy helps members of The United Front for DemocracyAgainst Dictatorship (UDD) prepare Molotov cocktails to throw atsoldiers. 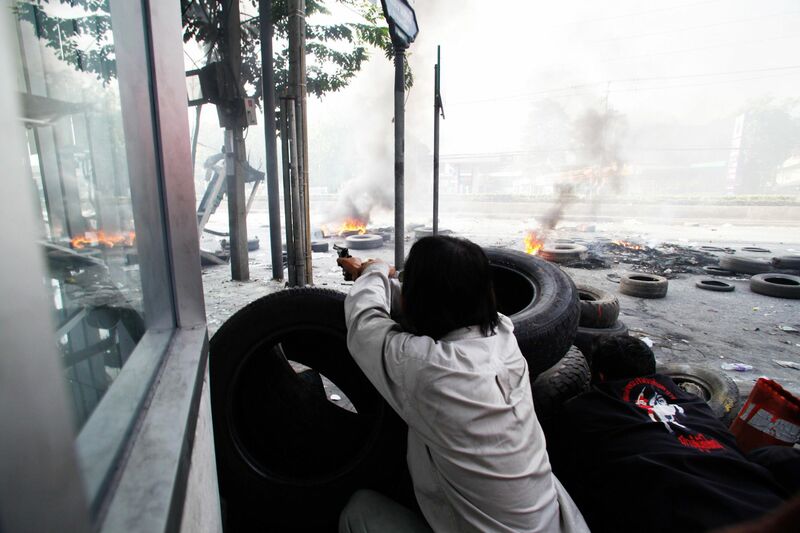 A member of The United Front for Democracy Against Dictatorship(UDD) shoots at soldiers during a clash with government forces. 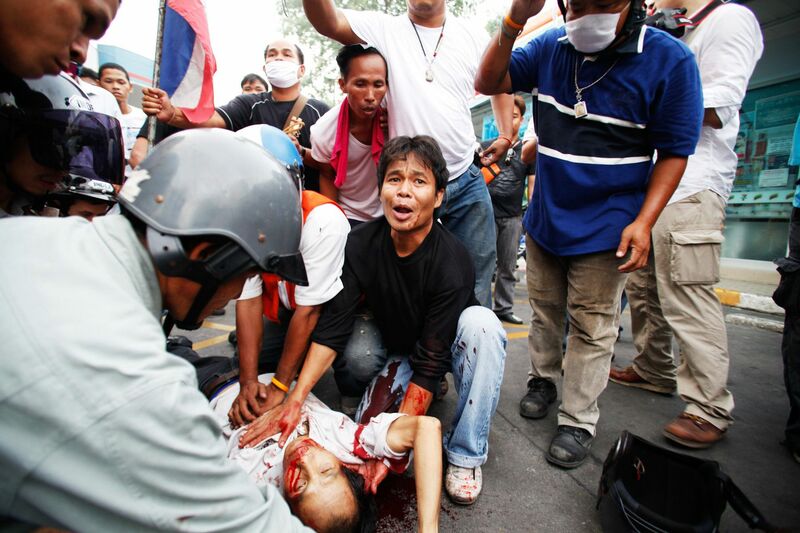 Members of The United Front for Democracy Against Dictatorship(UDD) aid a man shot by soldiers. 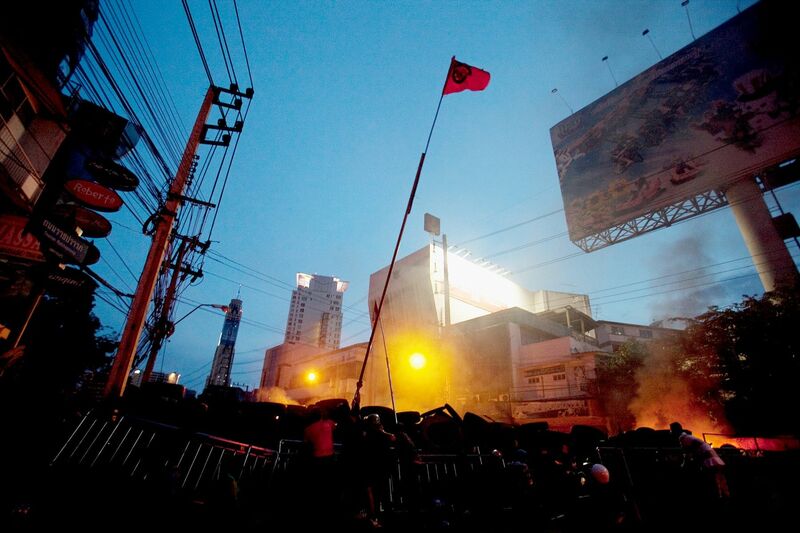 Members of the United Front for Democracy Against Dictatorship(UDD) fly a red flag during a clash with soldiers. 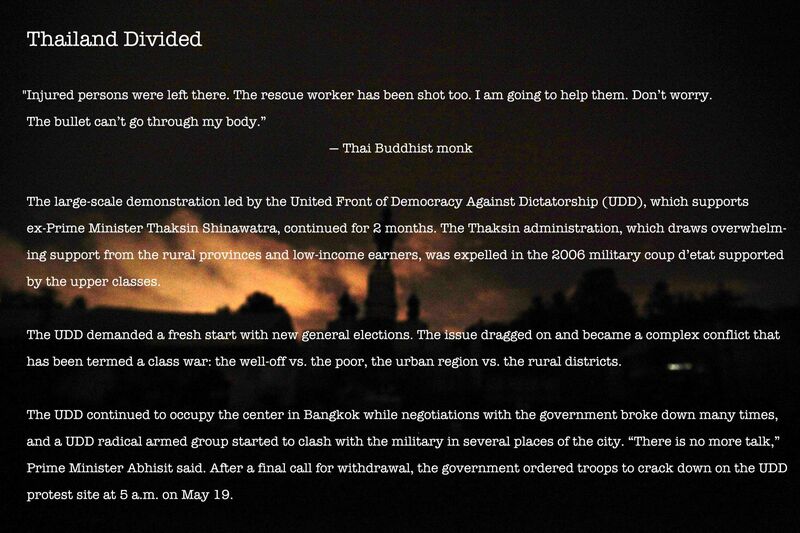 A member of The United Front for Democracy Against Dictatorship(UDD) took off his clothes to celebrate his courage after shooting off a big firecracker that exploded near soldiers. 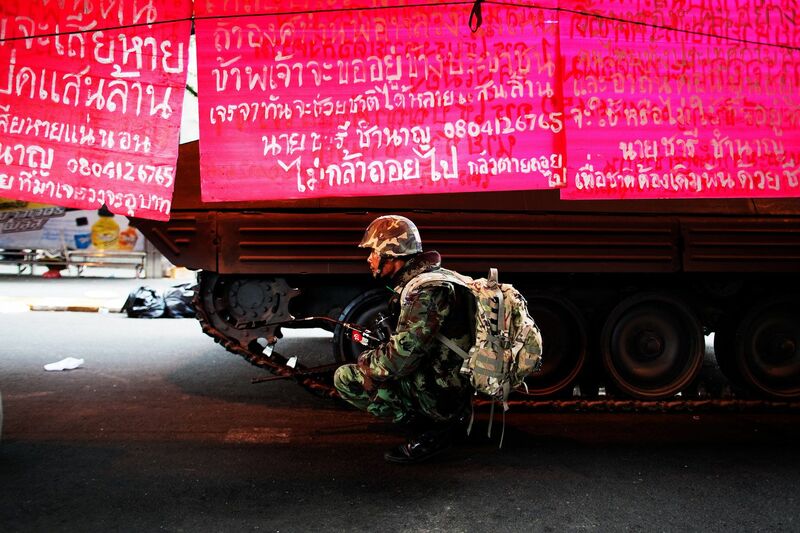 Soldiers catch up on sleep in the carpark of a central Bangkok department store near the United Front for Democracy AgainstDictatorship (UDD) demonstration site Sukhumbit Road. 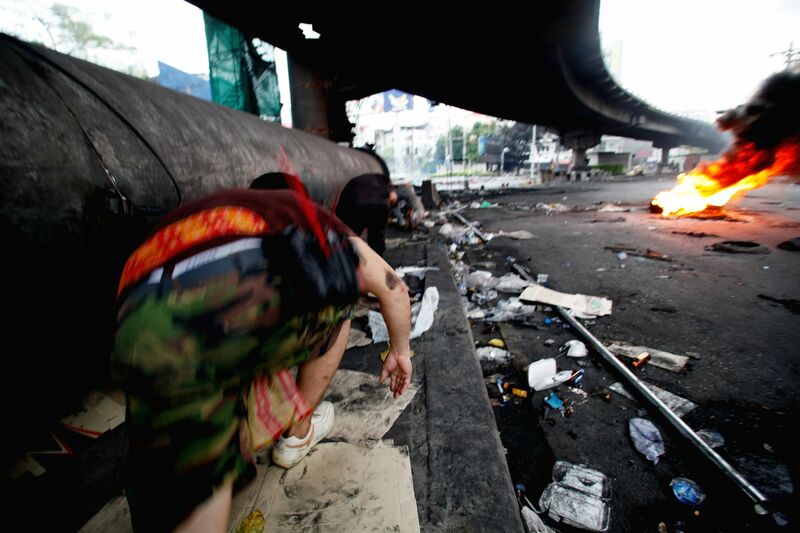 Soldiers enter the United Front for Democracy Against Dictatorship(UDD) encampment on the morning of the government crackdown against UDD demonstrators. 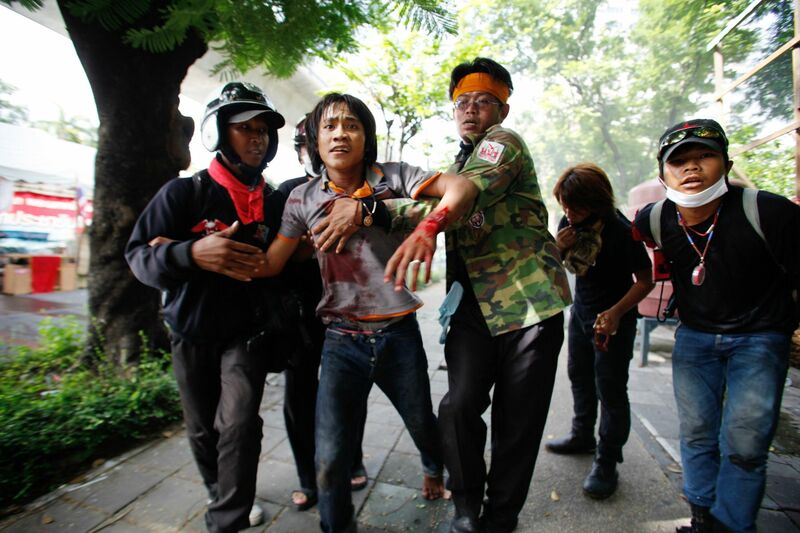 An injured United Front for Democracy Against Dictatorship (UDD)member being helped to safety during the military crackdown against UDD demonstrators. 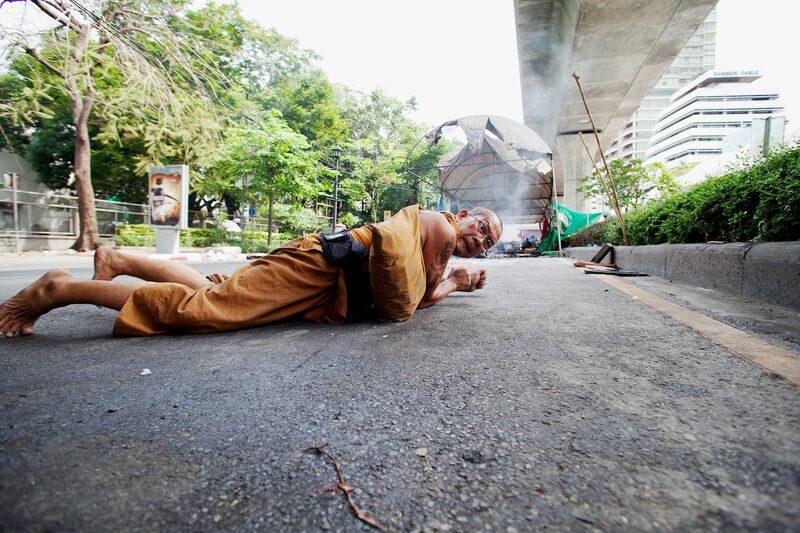 A monk supporter of The United Front for Democracy AgainstDictatorship (UDD) takes cover from heavy gunfire during the military crackdown against UDD demonstrators. 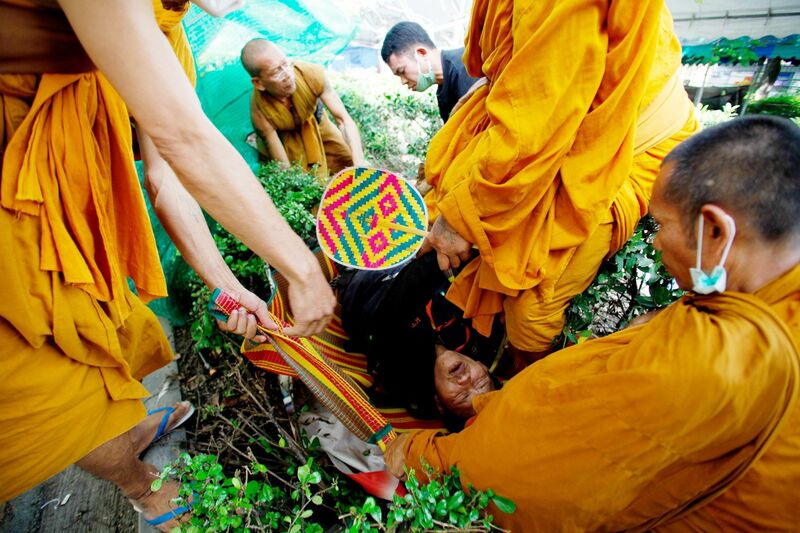 Under heavy gunfire, monks carry an injured United Front forDemocracy Against Dictatorship (UDD) member to safety on Rachadamri Road during the military crackdown against UDDdemonstrators. 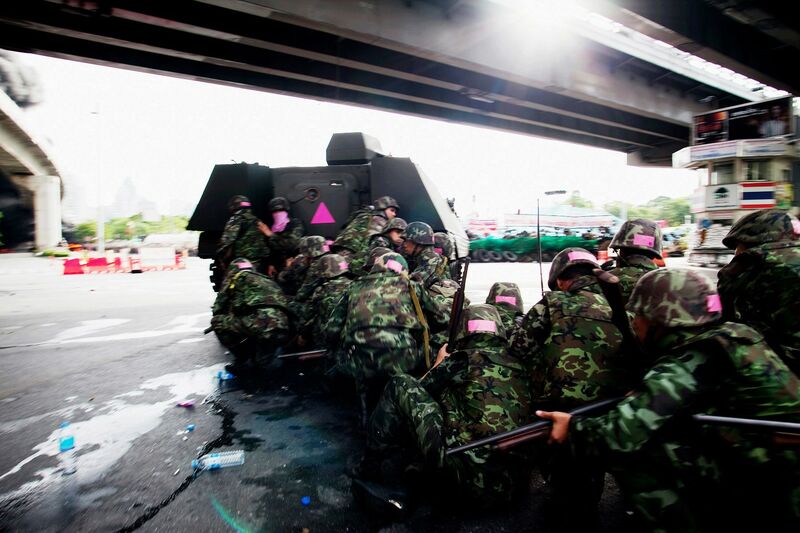 Soldiers secure the United Front for Democracy Against Dictatorship(UDD) encampment on the second day of the government crackdown against UDD demonstrators. 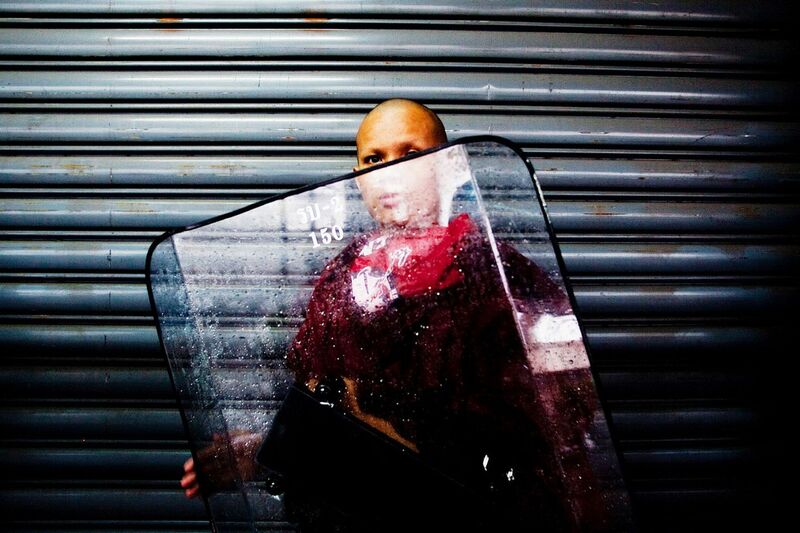 An Italian photojournalist, Fabio Polenghi being carried to a hospital after having been shot during the military crackdown against UDD demonstrators. 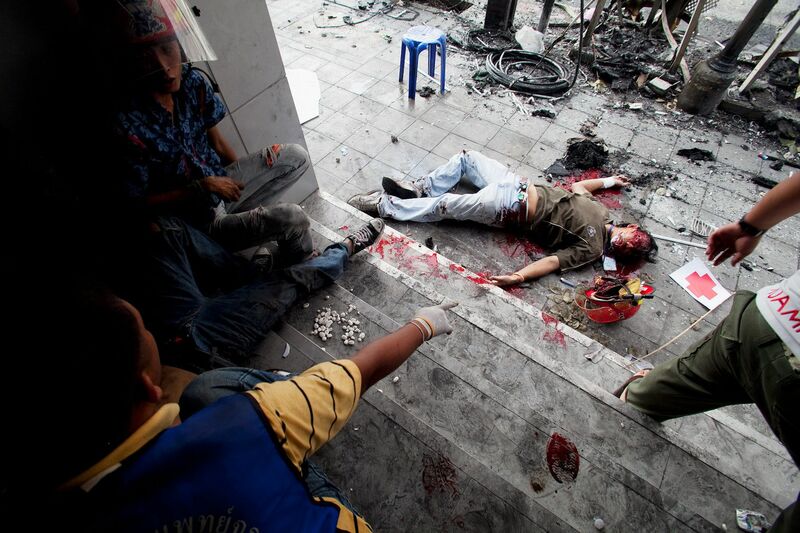 He died at the hospital. 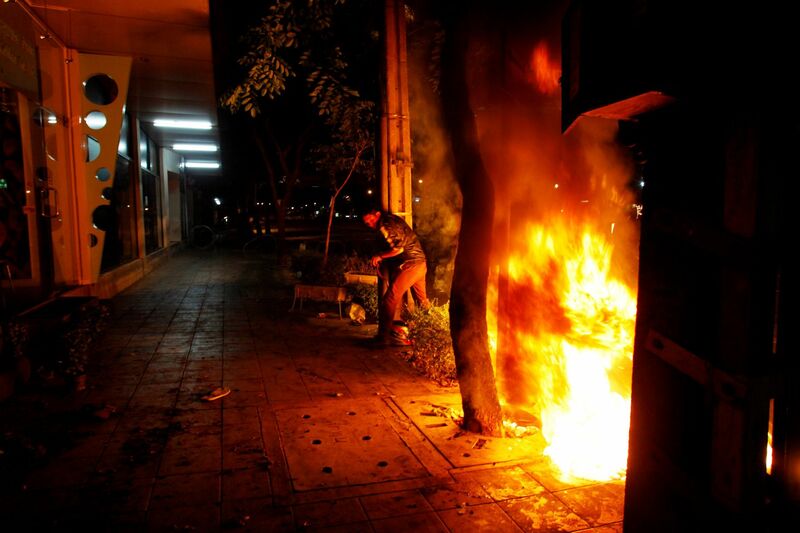 United Front for Democracy Against Dictatorship (UDD) demonstrators loot and set fire to department stores after their leaders surrendered to the government. 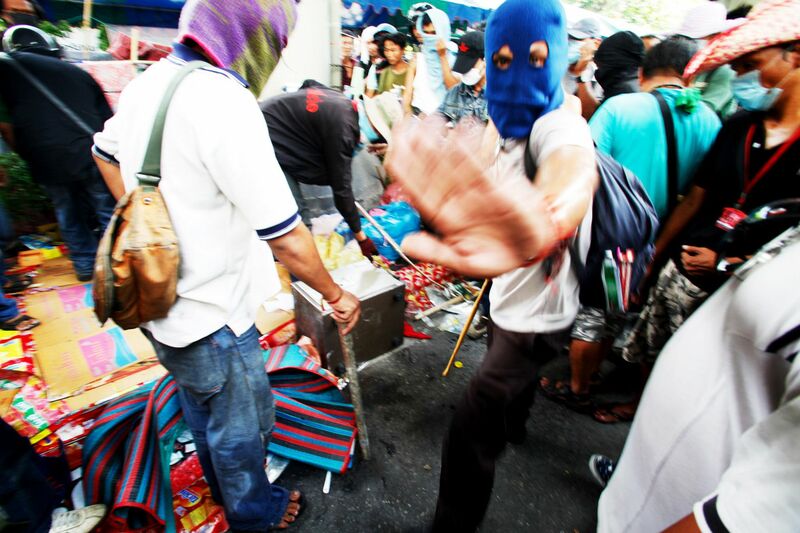 United Front for Democracy Against Dictatorship (UDD)demonstrators try to open a safe stolen from a department store during riots that followed the surrender of UDD leaders to the government. 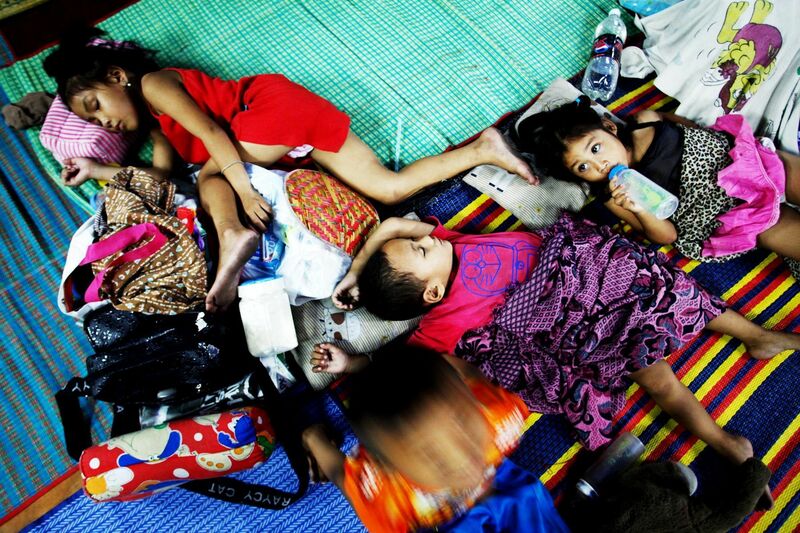 Children of United Front for Democracy Against Dictatorship (UDD)protesters were evacuated to the Pathumwanaram Temple during the military crackdown on the UDD. 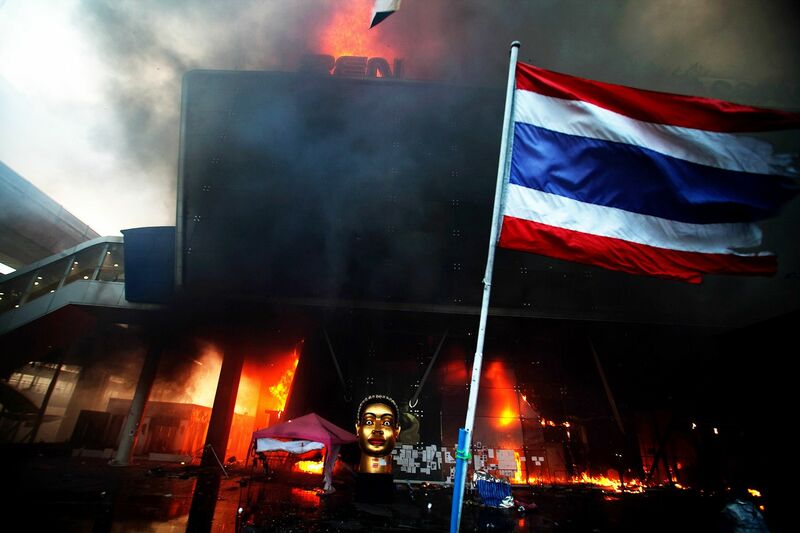 United Front for Democracy Against Dictatorship (UDD)demonstrators loot and set fire to department stores after their leaders surrendered to the government. 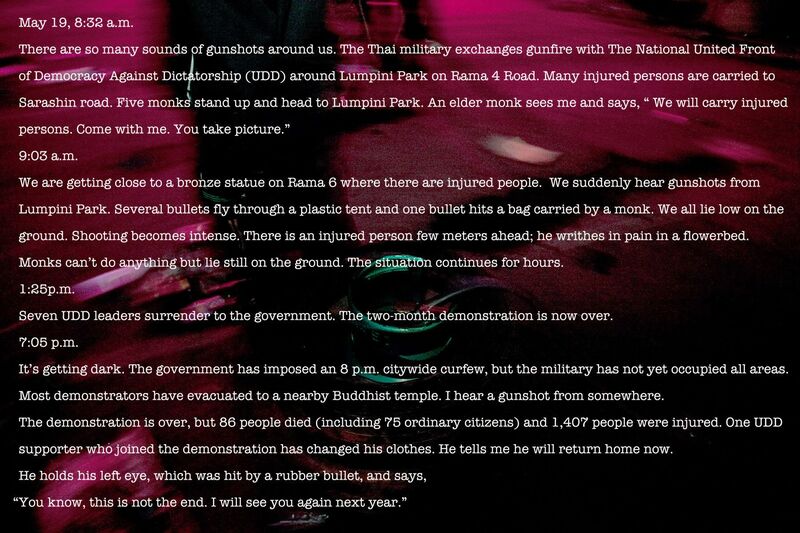 Six dead bodies were inside the Pathumwanaram Temple on the second day of the government crackdown against UDD demonstrators. 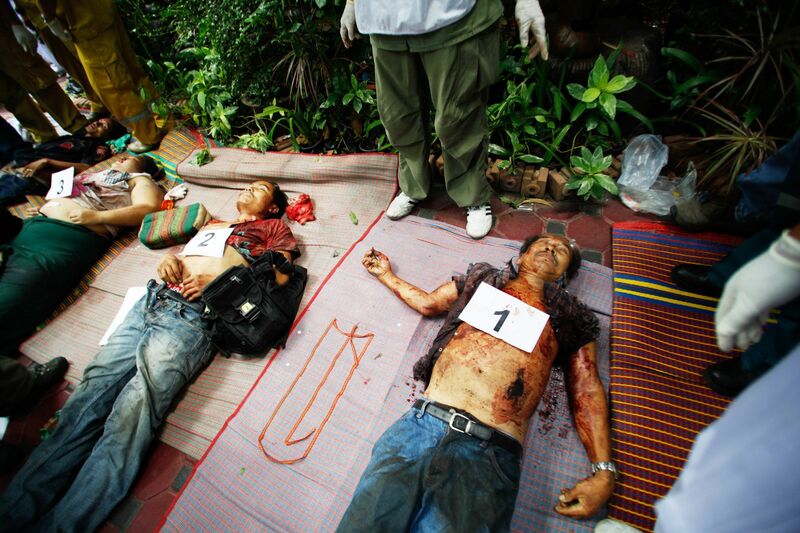 There is no information about their death.